On Wednesday night I was lucky enough to attend an event held by AX Paris & etailPR at Circus in Covent Garden. It was to celebrate the launch of their new TV ad, and we got a sneeky preview of the SS13 collection too! I had won a pair of tickets the week before and had asked my friend E to come along with me. We arrived at Circus just after 6pm and were greeted at the door by Kim. Once we’d entered the club we were handed a cocktail each & off we went to mingle. There were perfomances by Circus throughout the night, which were absolutely amazing. There were canapés & punch cocktails and we were kept topped up all evening. 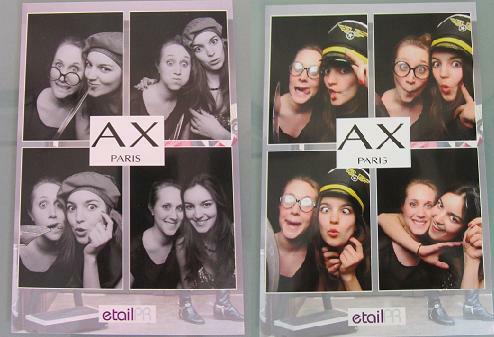 There was also a photobooth that we of course had fun mucking around in! I met some lovely girls, including Steph & Alex, and it was lovely to bump into a couple of familier faces too! There was a raffle towards the end and E was one of the winners! The Dirty Works prize included a body shimmer, face mask, lip plumper, body butter, coconut body wash and a body scrub, oh and a cute polka dot bag to keep it all in! We browsed the SS13 collection and I fell in love with the green and black number that’s poking out. As we left, we were handed a goodie bag which was full of lovely things, including dry shampoo by Batiste, some UV hair colour by Colour Xtreme and a facial cleanser from Etat Pur. Some eyelash curlers from The Vintage Cosmetic Company, nail tattoos & nail polish by Beauty UK. I have to say one of my favourite things from the bag was this Bohemian Collective above knuckle ring. A Ryan Gosling colouring in book? GENIUS. Some yummy goodies from Propercorn, PopChips, Coldpress and Tea Pigs. And finally these amazing Galactic Sky tights from Pamela Mann. I had a really great evening and everyone was so lovely. Thanks to E for coming with me and to AX Paris for hosting the event! It was so much fun wasn't it! I saw Alex, but never saw you!, boo!